The Georgia Department of Transportation will close the Courtland Street bridge from May 7 through October 2018. C.W. Matthews Construction Co. has been contracted to reconstruct the bridge, running from Gilmer Street SE to Martin Luther King Jr. Drive SW, to provide a bridge better suited for increased traffic and heavier vehicles. 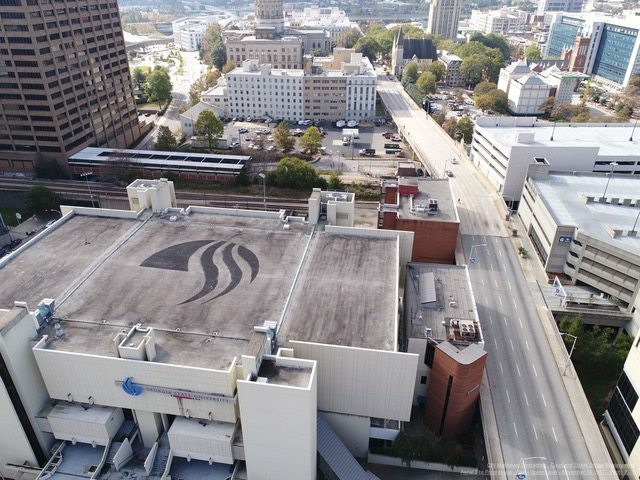 The Courtland Street bridge will close on Georgia State University’s Atlanta Campus on May 7. The bridge will be closed to vehicular and pedestrian traffic from May – October 2018. Learn more below. Streets and parking lot entrances to G Deck and the C, E and L lots on Georgia State’s Atlanta Campus will be affected during construction that will replace all 28 spans of the Courtland Street bridge over the MARTA and CSX rail lines and Decatur Street. The project extends on Courtland Street from Gilmer Street SE to Martin Luther King Jr. Drive SW (Sparks Hall to below the entrance to G Deck on Courtland Street). To aid traffic flow from G deck, a new interchangeable access point is now available and can be reached by using Kimball Way to get to Lower Wall Street. This entrance/exit is for permit holders only. Entry times ONLY is 6:30 a.m. until 1 p.m. This entrance/exit is at ground level in G Deck. To reach Lower Wall: Use Decatur Street and turn onto Kimball Way, which is beside the surface parking lot and the College of Education & Human Development building. Exit ONLY is 1 p.m. until 6:30 a.m. Monday – Friday. This access is closed on the weekends. Once you exit the deck, you may gain access to other roadways by turning onto Lower Wall and then Decatur Street. Or, you can proceed straight and get to Fairlie Street NW to Marietta St. The Collins Street entrance to G Deck closed to parkers on March 17. Handicap parking will be on the 3rd and 4th levels of G deck to provide building access while the Collins and Courtland entrance/exits are closed. U lot replaces E lot as the Handicap parking lot for Georgia State affiliated permitted parkers on campus. Access to U lot requires special registration with the Georgia State Parking Office and a current Handicap placard. Exceptions may be made for parking accommodations during major university events. This section of Collins Street closed to pedestrian traffic on Feb. 19 and will remain closed through October 2018. Access to the Courtland North building will be maintained. 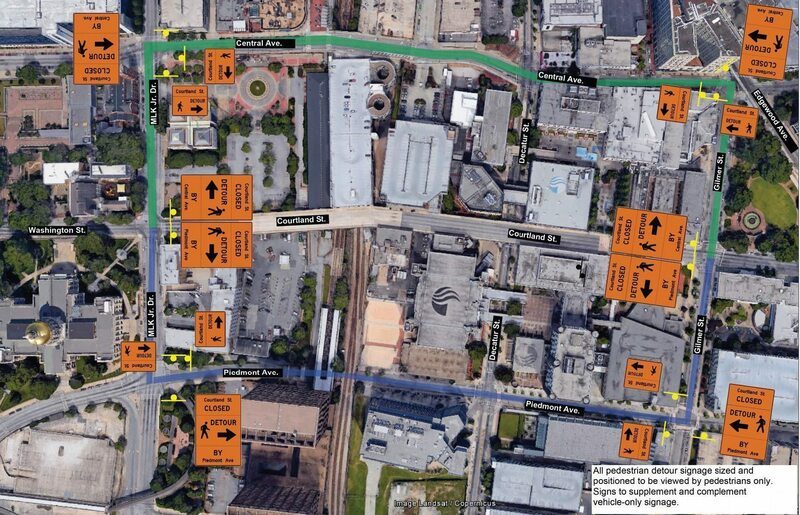 Employees have to access these lots from Peachtree Center Avenue. Pedestrians are not allowed to walk along Collins Street from the Student Center doors near Chick-Fil-A to Decatur Street after Feb. 5. A protected pathway will be available throughout the project to connect the Student Center Unity Plaza with the north-end entrances to the Bookstore and Student Center West. A protected passageway will be available throughout the project to connect the Decatur Street sidewalk to the southern entrance to Student Center West. Pedestrians will be safely guided through protected pathways on Collins Street to access Student Center West (both Collins entrances), Courtland North and Sports Arena, while foot traffic on Courtland will be directed away from construction activity to offsite routes. A temporary passage to the ADA entrance to Sparks Hall on Courtland Street will be provided until the new ADA entrance on Gilmer Street is completed not later than May 25, at which time this passage will be removed. 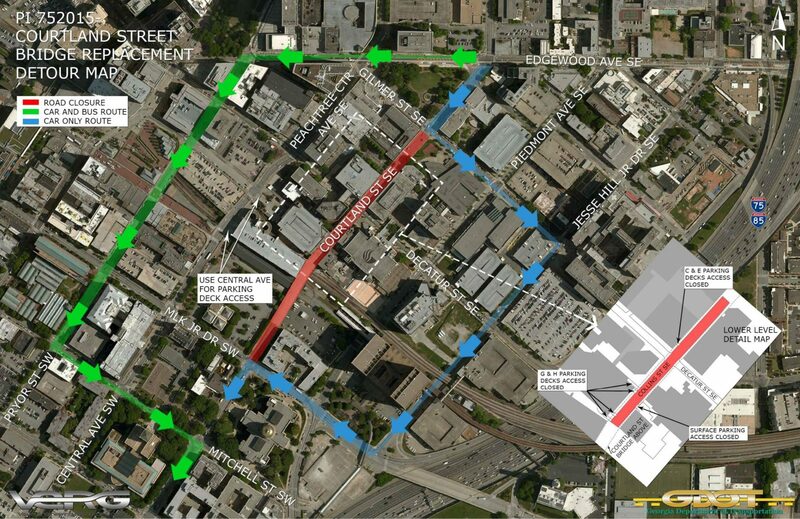 Vehicular traffic will be routed to an offsite detour during the demolition and the construction. Cars and Buses (route shown in green below) will follow Edgewood Avenue, Pryor Street, and Mitchell Street for a length of approximately 0.8 mile. Cars Only (route shown in blue) will follow Gilmer Street, Jesse Hill Jr. Drive, and Martin Luther King Jr. Drive for a length of approximately 0.7 mile. The Panther Express blue route has been adjusted for the bridge project. The blue route will only pickup and drop off on Peachtree Center in the front of Langdale Hall. For more information, visit http://transit.gsu.edu/pantherexpress/. Express buses, such as Xpress and Gwinnett County Transit, have posted new routes to their websites. Georgia State is working closely with C.W. Matthews to provide updates as the work progresses. If you have questions or concerns, email courtland@cwmatthews.com or call 678-809-8219.